The May Cruise is ready for on boarding! Please fill out the registration form below to be added to the 2019 crew list. The 2019 Annual Viking May Cruise is set to take place May 17 to 20. This year there we will be four boats, including our lovely Tyra, with room for 27 people. 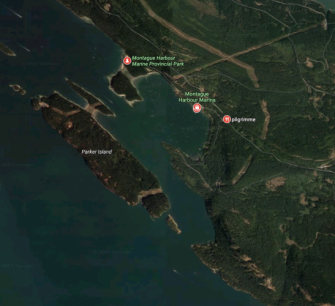 We will be departing Saturday morning from Sidney and heading to Wallace Island Marine Park, where we will raft for the night or and plan on walking across the island to see the magic that was once resort in 1950’s. Sunday we sail back to Browning Harbour on North Pender Island. Sunday night we have confirmed berths on the dock at Port Browning. Dinner is either on the dock or at your pub of choice. Finally back to reality and Port Sidney Marina on Monday, with a good possibility of an exploratory lunch hook at Sidney Spit on the way. 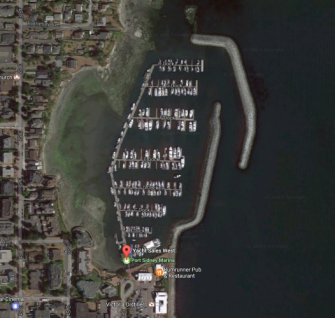 Make your way to Cooper Boating – Port Sidney Marina which is a few minutes’ drive from the Swartz Bay ferry terminal. Since it is a holiday weekend there are extra sailing options out of Tsawwassen. The orange Sidney Taxis are the best option for the short drive into Sidney. Avoid taking the yellow taxi’s as they primarily go to Victoria and may charge more. Public transit departs approx every 30 min from Swartz Bay and the stop in Sidney is at Fifth & Beacon (approx. 6 blocks walk from the marina.) At the Marina there is paid parking available at a cost of $11 per day. Parking passes are available through the Marina Office and must be displayed on the dashboard of the registered vehicle. Our Boats will be available to board between 1600 and 1800 . Once your gear is stowed join your fellow Vikings at one of the port restaurants – Rumrunner Pub or The Surly Mermaid are Viking favourites. Supplies are available a short walk into town and there are several options. Fairway Market is located about a two minute walk up the street. Feel free to use your shopping cart to bring your groceries back to your boat, then return it to the pick-up area at the top of the dock ramp. Thrifty Foods offers grocery delivery within the area. There is a BC liquor store in town and Beacon Landing Pub near the marina sells beer & wine. We will aim to be back between 3pm and 4pm on Monday, to allow for the 17:00 or 19:00 return ferry to Tsawwassen on Monday. If you know you are taking the ferry make a reservation now to confirm you get the sailing you want. The cost is $325 for members and $350 for non-members. The fee covers the cost of the charter. 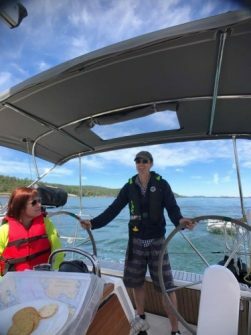 Provisioning is organized by your Skipper and the cost is shared by everyone on your boat (three days’ groceries plus moorage, which will be around $50-75 for the boat). Other costs, including eating out or any alcohol you want to bring, are your own. Each boat is equipped with refrigeration and cooking facilities. The May Cruise Planning Meeting will be held at Jericho (Northwest room) on Thursday, May 9th, 2019 at 1900. We are a teaching club and in the past everyone who wanted got a chance to take the helm. However things have changed. In 2009 the Federal Government introduced new licensing requirements which require anyone in control of a boat with a motor (whether it is on or not) to have their Pleasure Craft Operator Card (PCOC). If you do not have one, there are plenty of opportunities to take the exam in the spring. Please consider getting yours before the cruise. 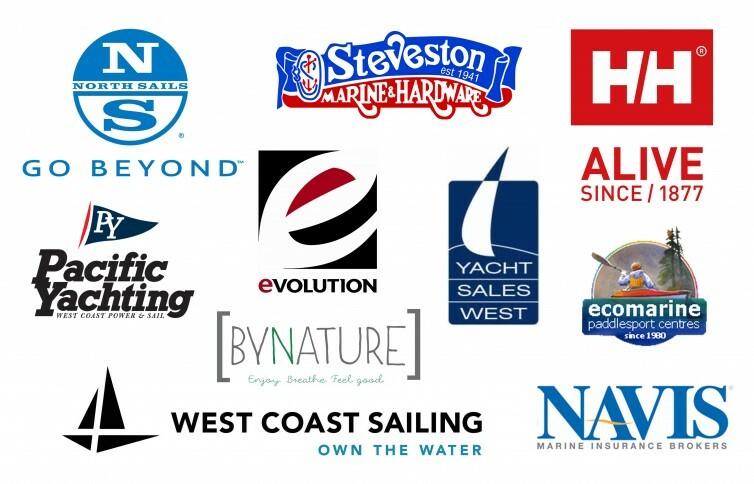 The charter company does not outfit boats with bedding for charters of less than a week. This means you need to bring your own pillows, bedding, and towels. You can reserve your spot by filling out the form below. I will send you the link to do credit card payment. Reservations are on a first-paid, first-reserved basis with a total of 27 spots available. Act early to avoid disappointment – the May Cruise always fills up. New members are especially welcome. No previous sailing experience is required, and you do not need to know anyone – just sign up! 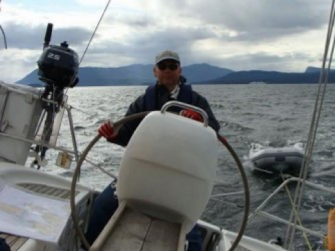 staff-captain@vikingsailingclub.bc.ca to contact Steve Smith Staff Captain directly. I will confirm either your spot or your place on the waiting list. The May Cruise is ready for boarding! Please read on to find out how to sign up! The 2018 Annual Viking May Cruise is set to take place May 18 to 21. 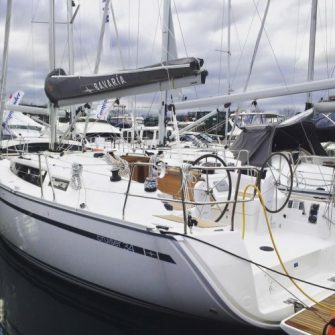 This year there we will be a total of 3 boats, including our lovely 34′ keelboat TYRA, with room for 20 people. We will be departing Saturday morning from Sidney and heading first to Russell Island Marine Park, where we may stay the night or carry on to Winter Cove Marine Park. In both cases we will be eating dinner on board at anchor on Sat Night. Sunday we have options during the day at Reef Harbour, Cabbage Island and Tumbo Island Marine Park or Winter Cove. Sunday night we have confirmed berths on the dock at the luxurious Poet’s Cove Spa and Resort. All guests on the dock have free use of the heated swimming pool and hot tub, as well as the free (no quarters required!) showers. Sunday dinner is either on the dock or at your pub of choice. Make your way on Friday afternoon or evening to Cooper Boating – Port Sidney Marina which is a few minutes’ drive from the Swartz Bay ferry terminal. Since it is a holiday weekend there are extra sailing options out of Tsawwassen. Our Boats will be available to board between 1600 and 1800. Once your gear is stowed join your fellow Vikings at one of the port restaurants – Rumrunner Pub or The Surly Mermaid are Viking favourites. We will be back in Sidney between 14:00 and 15:00, to allow for the 17:00 or 19:00 return ferry to Tsawwassen on Monday. The cost is $275 for members and $300 for non-members. Cheaper than 2017 Rates! The fee covers the cost of the charter. Provisioning is organized by your Skipper and the cost is shared by everyone on your boat (3 days’ groceries plus moorage, which will be around $50-75 for the boat). Other costs, including eating out or any alcohol you want to bring, are your own. Each boat is equipped with refrigeration and cooking facilities. The May Cruise Planning Meeting will be held at Jericho (Northwest room) on Thursday, May 10, 2018 at 1900. In 2009 the Federal Government introduced new licensing requirements which require anyone in control of a boat with a motor (whether it is on or not) to have their Pleasure Craft Operator Card (PCOC). If you do not have one, you can take an online class and obtain your license in an afternoon through a site such as https://www.boatnbob.com/. Please consider getting yours before the cruise. Supplies/groceries are available a short walk into town and there are several options. Fairway Market is located about a two minute walk up the street. Feel free to use your shopping cart to bring your groceries back to your boat, then return it to the pick-up area at the top of the dock ramp. Thrifty Foods offers grocery delivery within the area. There is a BC liquor store in town and Beacon Landing Pub near the marina sells beer & wine. Steve will arrange payment with you directly via credit card or cheque. Reservations are on a first-paid, first-reserved basis with a total of 20 spots available. Act early to avoid disappointment – the May Cruise always fills up. New members are especially welcome. No previous sailing experience is required, and you do not need to know anyone – just sign up! 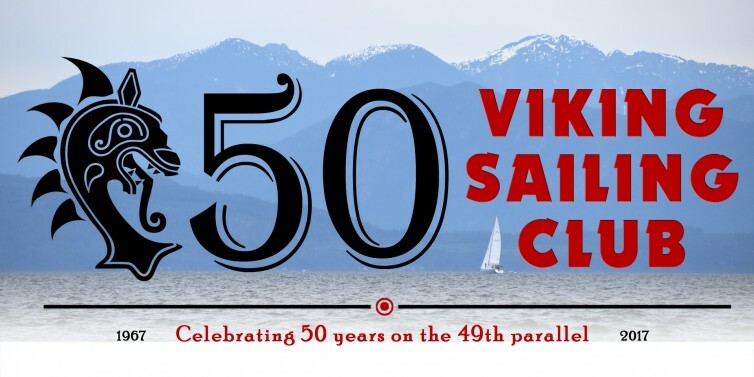 Did you know that the Viking Sailing Club is celebrating 50 years this year and is the longest standing sailing co-op in BC? Join us for our 50th Anniversary Gala on Saturday, June 24, 2017 at the Jericho Sailing Centre as we celebrate our legacy and our future. We will kick-off the evening with opening remarks from Councillor Andrea Reimer, Park Board Commisioner Sarah Kirby-Yung, and Councillor and Deputy Major Raymond Louie, and our Commodore, Petra Hoerrmann. Opening remarks will be followed by a champagne toast and the opening of our 25 year old time capsule. A catered dinner will be provided for all advanced ticket holders, and the bar will feature our signature Viking Spirit cocktail. After dinner we will be hosting our Viking Spirit contests for Barbarian Beard and Shield Maiden’s Arm Wrestling Match Champions, and will challenge Vikings to out-dance each other on the dance floor. Don’t miss out on this opportunity to celebrate 50 years of Viking sailing. Join us on June 24, 2017 to drink like Vikings do, pillage the dance floor and celebrate our mark on the sailing community both at Jericho and worldwide! 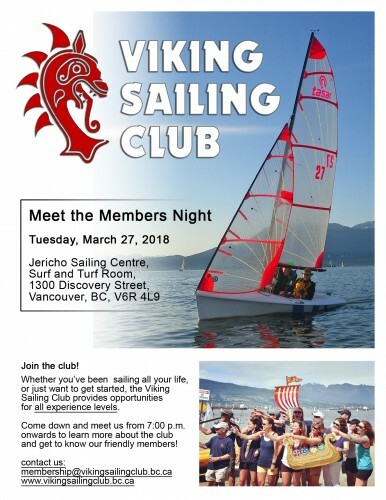 Location: Upstairs at the Jericho Sailing Centre, 1300 Discovery Street in Vancouver, B.C. Get your ticket now to reserve your spot at the 50th Anniversary Gala. Hold your favourite beverage in style! This year for our 50th anniversary, we are offering beautiful glass-bottomed English pewter tankards engraved with the Viking dragon logo, a great sturdy addition to your sailing kit. Order yours, and it will be available for pickup at Jericho in mid-August. Includes entry to the venue, full dinner (catered), dance with live band, champagne toast, and a chance to win some amazing door prizes. Go directly to the ticket site or buy below. We would gratefully like to acknowledge the generous support of our sponsors. The May Cruise is Sold Out! You can fill out the registration form to be added to the wait list, though. The 2017 annual Viking May Cruise is set to take place May 19 to 22. This year there we will be four boats, including our lovely Tyra, with room for 20 people. We will be departing from Sidney and heading first to Montague Harbour on Galiano Island, then on to Ganges on Saltspring Island, and finally back to Sidney. This gives us a beautiful anchorage, provincial park & beach area to explore for the first night and the second night in the town of Ganges. We will depart first thing in the morning and head north east to Galiano Island where we will anchor for the night. Montague Harbour has a lovely provincial park well known for its white shell beaches. Depending on your sail, you may have time for some hiking, swimming, photography or just lazing on the beach. 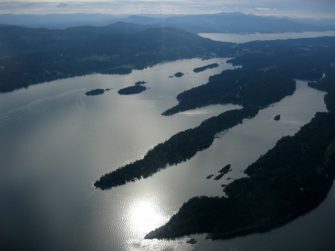 It is a short distance from Montague to Ganges on Saltspring Island which give everyone a wonderful opportunity to sail and explore the area. We will have reservations at Ganges Marina which is a few minutes’ walk from town. The marina has clean bathrooms, showers, and laundry. Ganges pretty much has it all including a yummy taco bar, winery within walking distance, artisan shops, grocery & hardware stores, BC liquor store, and a number of excellent restaurants. It’s time to head back to Sidney – hopefully with the wind at our backs. We will aim to be back between 3pm and 4pm, to allow for the 17:00 or 19:00 return ferry to Tsawwassen. The cost is $340 for members and $365 for non-members. We are putting fewer than the maximum per boat to make life aboard more comfortable. The fee covers the cost of the charter. 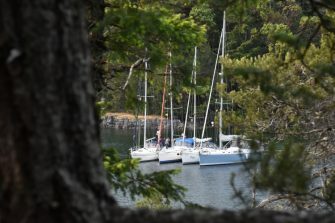 Provisioning is organized by your Skipper and the cost is shared by everyone on your boat (three days’ groceries plus moorage, which will be around $50-75 for the boat). Other costs, including eating out or any alcohol you want to bring, are your own. Each boat is equipped with refrigeration and cooking facilities. The May Cruise Planning Meeting will be held at Jericho (Northwest room) on Wednesday, May 10, 2017 at 1900. You can reserve your spot by filling out the form below. I will send you the link to do credit card payment. Reservations are on a first-paid, first-reserved basis with a total of 20 spots available. Act early to avoid disappointment – the May Cruise always fills up. New members are especially welcome. 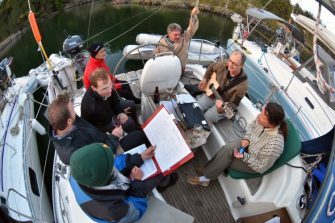 No previous sailing experience is required, and you do not need to know anyone – just sign up! If you don’t see a form, you need to log in first! It has been a while since I’ve updated you on the most recent happenings in the club. I’ll start with the most exciting topic – our new keelboat is here! We named her Tyra, thanks for all of you participating in the survey. The name Tyra means “A woman who appears very refined if a little haughty and who has a powerful presence. Independent and headstrong, she has bags of energy and usually gets her way without too much difficulty. Proud, and a little conceited.” so a great name for a Viking boat. If not already done, please come and have a look. You might have noticed our new logo on the boat and other places. 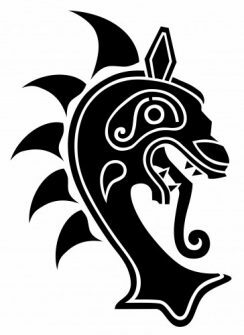 It is taken from an original Viking boat with sails added to the back of the dragon. Thank you, Liz, for the beautiful design. Also, she’s yours to use, go and book her. You only need a skipper and 2IC and then you can take her out. If any questions, please reach out to Greg Kostiw, he’ll can answer all your inquiries and help you with the booking process. Also, we’re in our 50th year! 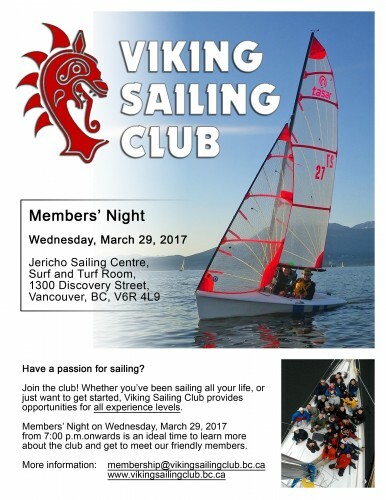 This is so amazing; we’re the one of the longest standing co-op sailing clubs in Vancouver. Something we can truly be proud of. Stay tuned for more to come regarding the festivities, but please mark the weekend of June 24th and 25th in your calendar for the big celebration. If you’d like to get involved in planning the events, please reach out to Veronica Owens, our Quartermaster. I’m also very happy to share that our new family membership has been taken up quite a bit, which is great. 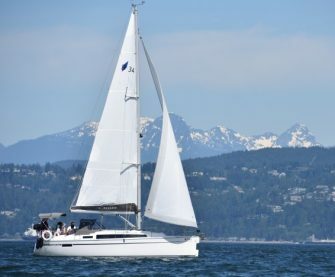 It allows your spouse and children to sail with you on our dinghies (if you’re senior rated) or Tyra without paying the guest fees and without limitations. We still allow guests to be invited, please remember that the guest fees for the keelboat and/or the dinghy fleet apply and they have to be registered at the JSC front desk. Also, there is a limit of 2 times on the dinghy per guest as well as we’re not training guests on the dinghies. We’re hoping to entice the guests to become members of the club, then we will train them properly. Speaking of training, please check our website for the training schedule and sign up to train our novices. For those of you who have already renewed their membership, thank you very much. For those who haven’t yet, there is still time. I know it’s a bit hard to think about sailing just yet with all the snow happening, but it will start really soon! Hope to see you soon on the beach and also on our Member’s night on March 29th. This will be another fun event.